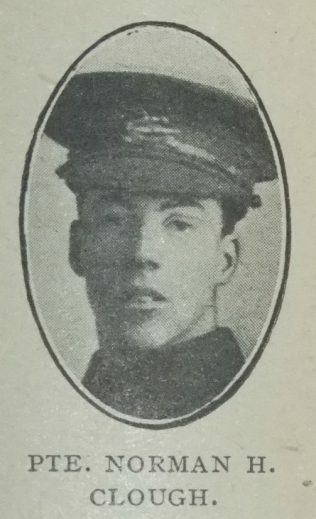 Norman Hargreaves Clough was called upon to make the supreme sacrifice on October 4th, 1917, when only nineteen years of age, whilst in charge of a Lewis gun. In the camp and trench, as at home and in his Church, he carried with him the same quiet dignity and Christian influence which make him hard to be missed. His early days were spent in Radcliffe street (Nottingham) Sunday School and C.E. Society, and when in his early teens his family went to Leeds and joined up with the Beeston Hill Church, Norman at once became general favourite, and at the age of seventeen years of age had taken an important place in the Church as assistant secretary, C.E. treasurer, choir librarian and Sunday-school teacher. He had natural gifts for speaking and was anxious to cultivate them. He was an exceptionally good artistic designer, and the silent tributes to his gifts are hung in the church today. Although so young, he had proved his worth very eloquently, and his cheerful optimism will be long remembered. Norman was Private 28259 in the Prince of Wales’s Own (West Yorkshire Regiment), 1st Battalion.